Learn to Make a Cylindrical Paper Rocket Heading — Skylighter, Inc.
A rocket "heading" is typically a shell mounted on the top of a rocket, designed to explode at or near the height of the rocket's flight. To me, headings are the punctuation mark for the rocket. For some folks they are the purpose of the rocket flight. Different strokes for different pyro-folks. Now, you can make these headings in a variety of ways. Or you can use "off-the-shelf" commercial shells. The purpose of this project is to show you the method that most serious fireworkers use. And although the project goes into a lot of detail, which you need, you can actually make these shells pretty quickly, once you learn how. This is an intermediate project. It is cross referenced to other projects. You will also have to acquire prepare a number of "ingredients" before you start the actual construction of the shell. So, read the project thoroughly, before you begin, so you'll know what you need. Now, you may have noticed that the 1.75-inch heading size is pretty close to consumer fireworks sized. Here's a picture of a line of rockets with headings just a little bit larger than the one in this project. Click on it, and watch the amazing variety of shells you can launch on the top of your rockets, once you learn these techniques. 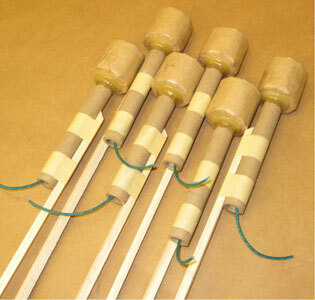 A series of beautiful homemade fireworks rockets. These rockets were made by PGI grandmast Tom Rebenklau. 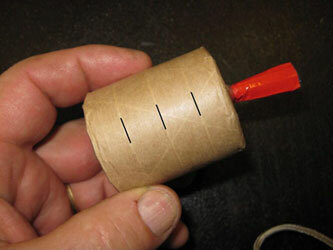 These small paper cylinder shells (sometimes referred to as canister shells) make great headings for fireworks-rockets. 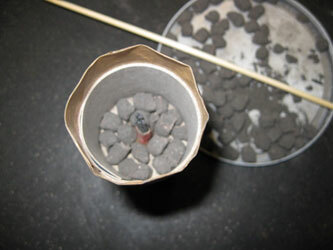 Paper fireworks shells and rocket headings have many advantages over plastic. Eventually every serious pyro hobbyist graduates to paper shell and rocket heading construction. The materials for paper headings are readily available. Paper shells are more environmentally friendly than alternatives such as plastic. They do not leaving sharp and non-biodegradable shards of plastic lying around the shoot site. Paper materials also lend themselves to more consistent shell casing strength, and better, larger, more symmetrical shell bursts. We're about to guide you through the process of building these headings, step by step. We want you to learn all the details of their construction. Once you have those steps down, each one of these shells will only require 15-20 minutes to make. Using dummy headings weighing between 1.5 and 2 ounces, dial in your rocket motors so they will reliably and repeatedly lift headings of this weight to an appropriate height. Here's is a short tutorial with information that will help you dial in your rockets. You'll need high quality black powder, either commercial or homemade, to burst these shells. Commercial black powder in the 4FA or Fg size-range (12-20-mesh) or 2FA (Cannon-grade) powder (4-12 mesh) will work well for these shells. 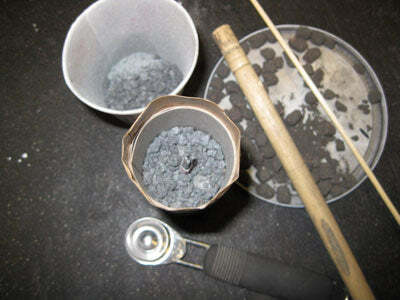 If you wish to make your own black powder, refer to this black powder tutorial on making quick, cheap and easy ball-milled black powder, or to this tutorial on homemade red-gum black-powder. You will need to make or acquire the aerial effects materials to put in your rocket headings that will create the display in the sky when the heading explodes. If you wish to make a star-shell heading, for example, you can make your own stars using this tutorial on Brilliant Rubber Stars. Commercially available fuses like flying-fish fuse or falling-leaves fuse will produce great effects, too. Note: It is strongly recommended that you read the following sections outlining materials needed for constructing these headings carefully. Gather all of these materials and prepare them according to the directions provided before you start building the headings themselves. This will avoid much difficulty, irritation and disappointment later. Note: First, though they are not absolutely necessary, some basic tools shown in this project will come in handy. Now might be a good time to pick up any of these tools that you don't already own. I guarantee they will be a worthwhile addition to your pyro workshop. An inexpensive utility caliper, available at home improvement stores. A micrometer, also available at home improvement stores. A utility paper cutter, available at office supplies stores. A set of hole punches, available at home improvement stores. 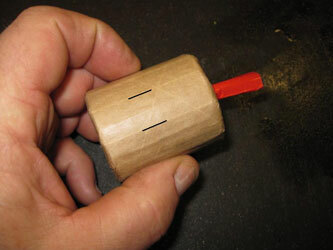 A "Handi-Cut" type cutter for cutting fuse. Always use this type of cutter for cutting fuse. Fiber-reinforced gummed kraft tape, available at office supply stores. 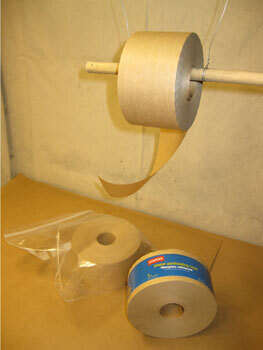 This 2.8-inch-wide, fiber-reinforced, kraft-paper tape is ideal for these headings, and many other, pyro-projects. It is thin and lies down nicely, but is reinforced with thin fiberglass fibers which increase its strength. With these relatively small headings, the fiberglass fibers in this tape will replace the traditional string-spiking which is typically used when making larger cylindrical headings and shells. Suggestion: When not in use, store the roll of tape in a one-gallon Ziplock baggie to prevent it from absorbing moisture from the air. 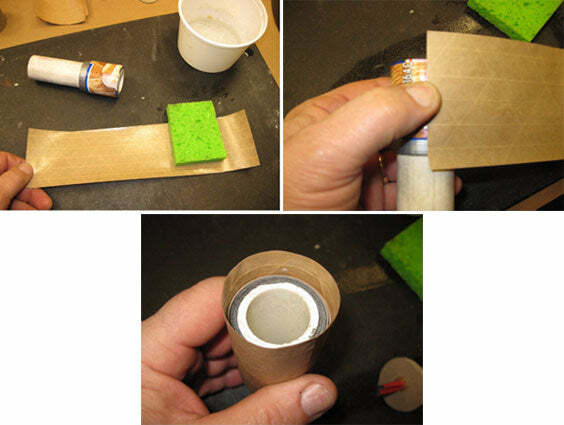 Moisture can stick the layers of tape together and ruin the roll. Suggestion: Rigging up a makeshift tape dispenser comes in handy when cutting particular lengths of tape off the roll. Two end disks will be used in each shell. We will be using disks that are 1-3/4 inches in diameter. You'll need a solid top disk (Skylighter #DK1600), and a bottom disk with a fuse hole in it (Skylighter #DK1601) for each heading. If you only have solid disks, the punch set recommended above can be used to punch a fuse hole in one of them. We will use a strip of light weight cardboard, sometimes referred to as "chipboard," such as the type normally used to make boxes for grocery items like cereal or crackers. Any similar light, flexible cardboard approximately 0.02 inches thick will do. 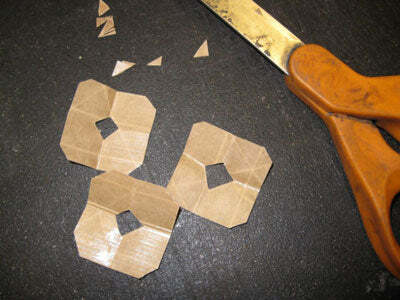 You'll notice that the cardboard bends easily in one of the directions, and with more difficulty in the other. Cut the strip with the long dimension oriented so that it wraps easily around the disk. Cut a strip that is as wide as the disk-diameter. For our rocket heading, that would be 1-3/4 inches wide. The strip length should be two times the disk circumference plus 1/4-inch. In our case, the circumference of a 1-3/4 inch diameter disk is almost exactly 5-1/2 inches. Twice that is 11 inches, and adding a quarter of an inch makes 11-1/4 inches. So our finished piece of cardboard should measure 1-3/4 inches wide by 11-1/4 inches long. A strip cut as wide as the disk will form a heading which is "square," meaning it is as tall on the inside as its ID. This shape lends itself to a symmetrical "roundish" break. Note: In the following video, I demonstrate cutting the cardboard strip using a 1-5/8 inch disk instead of the 1-3/4 inch disk we will use, but the technique is the same with the larger disk. Cutting cardboard strips on a paper cutter to use as part of a rocket heading. 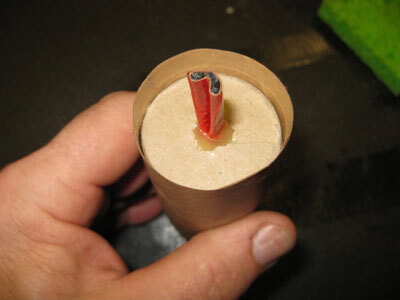 For a rocket heading quick match or paper-wrapped fast fuse is used to pass fire from the rocket motor to the heading. Hot glue and a hot-glue gun will be used during the construction. Warning: Hot-glue guns have been known to short out during use. It is important to use a quality glue gun. It is a very good idea to keep the glue gun housed on a stand or in a container which keeps the gun upright, and not lying in excess glue. It is also a very good safety precaution to keep the gun plugged into a switched power-strip, so the switch can be turned off when the gun is near live pyrotechnic materials and not in use. As noted above, fireworks stars or other inserts, such as flying-fish fuse, falling-leaf fuse, or others will be used in the shells. 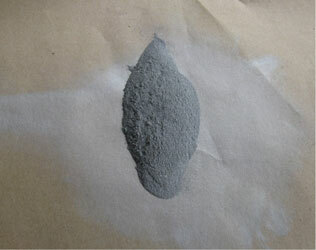 Granulated black powder, either commercial or homemade (as described above) will be used to burst the shells. An optional slow-flash-booster may also be used in conjunction with the black-powder burst to enhance the shell's break. This booster is described below. Rocket heading shell casings are rolled on a case former of the appropriate diameter. A hollow core in the case former, or a hole through it lengthwise, allows for easy removal of the former after the case is rolled on it. The two wraps of light weight "cereal-box" cardboard will be rolled on the case former first. Then some of the gummed tape will be rolled on over the cardboard and extending beyond it at both ends. The chipboard disks will then be inserted into the ends of that construction. The sketch below shows how the cardboard, tape and disks must fit together (only one end of the device is shown). 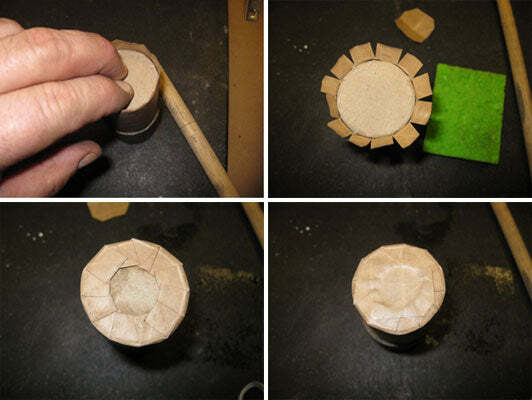 To achieve this fit, the case former must be small enough in diameter so that the disks will sit on the edge of the first turn of the cardboard wrap. At the same time, the diameter of the former plus the two turns of box cardboard must be slightly larger than the disks so that the disks can drop down inside the gummed paper wraps. From the sketch, it is apparent that the case former, on which the cardboard is wrapped, should have a diameter which is smaller than the disk's diameter by two thicknesses (the first wrap) of the cardboard. That way, when one turn of the cardboard is on the case former, the OD of that turn will be the same size as the chipboard disk. When the second turn of cardboard is applied, the OD of that wrap will be slightly larger than the disk. That will allow the disk to slide down inside the turns of gummed tape, and then sit on the inside turn of the cardboard, which will prevent the disk from going in any further. This case former was made from a 6-inch length of 1-inch PVC plumbing pipe, with some duct tape wrapped on it to bring it up to the desired diameter. In our case, the desired diameter is 1.71 inches. This is the diameter of our disks (1-3/4 inch) minus the thickness of two plies of the cardboard (0.04 inches), which equals 1.71 inches. Ok, you've dialed in your rocket motors, you've got your stars and black powder, you've gathered all of the necessary tools and supplies, and you've prepared your case former and cut your cardboard strip. Let's get started building. The configuration of this rocket heading is generally similar to a cylindrical aerial shell except for the ignition fuse. 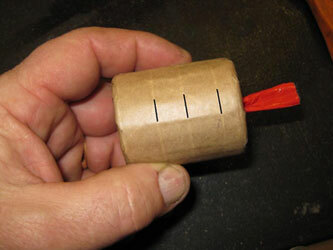 Instead of time-fuse, a piece of quick match or fast fuse is used with the black match bared at each end. The quick match will transfer fire immediately from the rocket motor to the heading, with no time delay. In our example project, we will be building a star shell heading, using brilliant rubber stars. 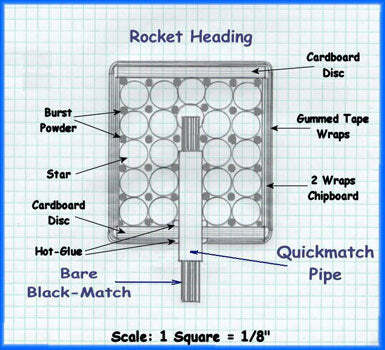 For a rocket heading, cut a 2.5-inch piece of quick match or fast fuse. In the following instructions and photos we will demonstrate the use of quick match, but process for using fast fuse is similar. If you have only solid disks, first punch a 1/4-inch hole in the center of one of the disks with a hole punch. Drilling this hole is not an ideal method in that it will leave a ragged, rough edge on the hole. If you have a pre-punched disk with a hole in it, this step should be skipped. Bare 1/2-inch of the black match at one end of the 2.5-inch piece of quick match. 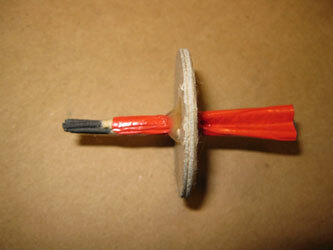 Hot-glue the quick match into the end disk as shown below. Ensure there is a good hot-glue seal between the quick match and disk. Wrap one turn of the cardboard strip tightly around the case former, aligning its edges. 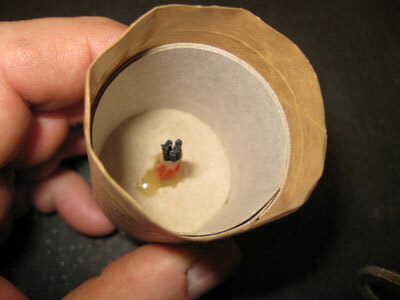 Apply a bead of hot-glue where the second turn starts and press the cardboard tight in that area. Naturally, we don't want any glue to get onto the former which would prevent the former from sliding out of the casing. Now wrap the second turn of the cardboard up nice and tight, and glue its end to secure it. 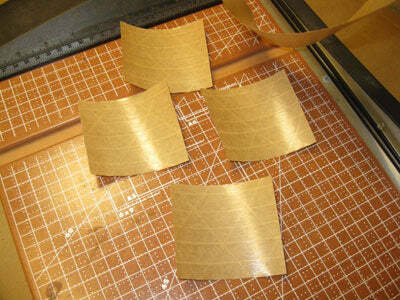 Cutting Pieces of Gummed Kraft-paper Tape. 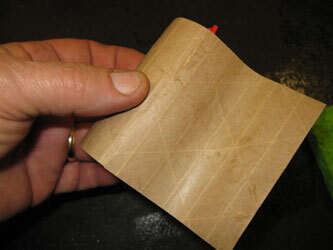 Cut two pieces of the paper tape long enough to go around the cardboard liner twice, plus 1/2-inch. Cut four pieces of the paper tape 3-inches long. Cut three pieces of the tape 1-3/8-inches long. 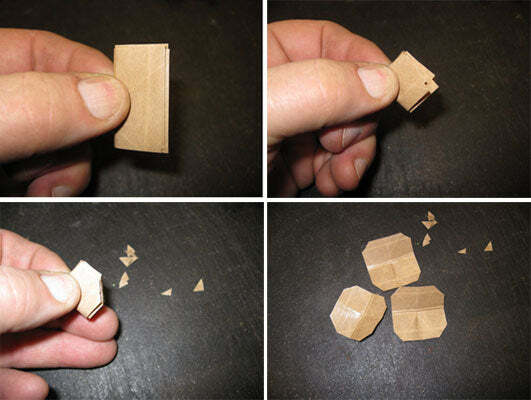 Cut those pieces in half so that six pieces, 1-3/8-inches square are created. Take three of those small square pieces of tape and fold them in half one way, and then in half the other way. Cut a 1/4-inch corner off of the loose, 4-layer corner, with scissors to create little octagonal pieces of tape. Repeat that with the other three small square pieces. In addition to cutting off the corners to create octagons, snip off the corner where all the folds come together, to make a square, 3/8-inch by 3/8-inch hole in the center of the pieces. 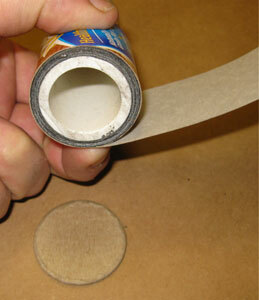 This step uses one of the long pieces of tape, which will make two turns around the cardboard liner. A plastic cutting board comes in very handy for use as a waterproof surface to put the tape on while wetting it. Dampen that tape's glue surface with a wet sponge. The tape should be pretty wet from the sponge, but not dripping. The glue on the tape will soak up quite a bit of water as it gets nice and sticky. Roll the tape on the casing, keeping the edges even, and leaving equal tape overhang on each end of the cardboard casing. Make sure the two layers are completely adhered to the cardboard casing, and to each other. Now insert the fused disk into the end of the casing, with the exposed end of the quick match, inside the casing. Make sure the disk is firmly seated on the turns of cardboard casing-liner. Using scissors, clip the gummed tape overhang every 1/2-inch. Fold the tape "ears" outward, and re-wet them with the sponge. Fold the ears back in and onto the disk, pressing them in place one at a time. Wet one of the tape octagons that have the hole in the center, and firmly press it in place over the tape ears. Rolling the corner of the casing on the cutting board will firmly press down, and smooth, the tape as it curves over that edge. The completed empty casing may now be removed from the former. It is ready to fill with stars and burst powder. 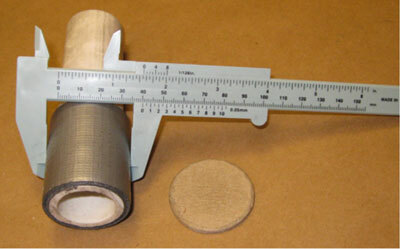 A short length of paper tube or PVC pipe is nice to use as a work stand for the rocket heading as it is being filled. Such a stand will allow the heading case to be supported upright without damaging the quick match fuse protruding from the bottom of the rocket heading. This demonstration will be using fireworks stars and homemade granulated black powder to fill the shell. Warning: At all times during the following steps, only small quantities of necessary flammable ingredients currently being used should be sitting open on the workbench. Absolutely minimize the amount of exposed pyrotechnic materials. A few stars igniting will spoil your day. A large tub of stars and a tub of black powder, all going up at once, will ruin your whole life. This safety precaution can't be overemphasized. Minimize exposure of live materials, wear only cotton clothing, and wear eye protection. Put one layer of stars in the bottom of the rocket heading casing, around the fuse. Adjust them as necessary to fit as many of them into the single layer as possible. A bamboo skewer comes in handy for arranging the stars. Add a half-teaspoonful of the black-powder burst granules, more or less, to fill in all the voids between the stars. A half-inch wood dowel is handy for pushing and tapping the burst powder gently into the star layer. Note: For small headings, black-powder burst alone is sometimes not enough to really "pop" the shells. A "slow-flash" booster powder may be added to the black-powder burst to make it hotter and speed the pressure-increase when the heading breaks in the sky. This optional slow-flash booster does not have to be used, and typically would not be used for a soft-breaking heading such as a willow or horsetail shell. It can be used when a hard, symmetrical break is desired, such as in a spider-web or a color-peony shell. Here's the formula for the slow-flash booster powder. You'll only need a very small amount for these headings so we'll adhere to good safety practice and keep the batch size small. One ounce is enough to boost 10-15 of these rocket headings. Warning: Like all compositions containing finely powdered metals, this slow-flash booster composition is both more powerful and more sensitive than black powder compositions. As such it is deserving of extra respect and care in mixing and handling. Each chemical is individually screened through a 40-mesh screen. The unmixed chemicals are then placed on a sheet of paper, and are only mixed by grasping the sides or corners of the paper and gently rolling the chemicals together on the paper. This is called the diaper method of mixing this slow-flash powder. When mixed, store safely in a closed plastic tub or other container. 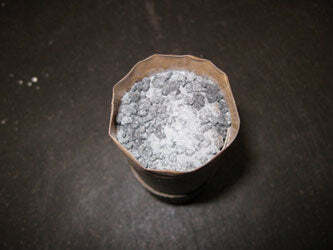 If the booster is used, adding a quarter teaspoonful of the booster, sprinkled over each layer of black powder will work well. Repeat the process of adding individual layers of stars, alternated with doses of burst powder, until the heading casing is filled just slightly over the top edge of the inner cardboard liner. 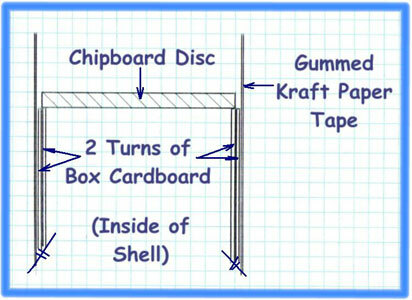 Insert a solid chipboard disk on top of the shell contents. While applying some pressure with the fingers, gently tap the outside of the shell with the half-inch dowel to settle the contents. Filling the heading solidly is key to creating a good strong heading. It also assists in creating a nice, full burst when the heading breaks. Seal the top of the shell with the gummed tape in the same way the fused end was sealed. Finish it with a solid octagonal piece of the tape as shown. Roll the shell sides and corners between each tape layer to smooth them. Now we'll apply the rest of the layers of gummed tape, using the pieces of tape we cut previously. Applying this tape carefully, sealing all of it to itself and the heading casing, and closing all the gaps in it, all go together to create a strong casing which will create a nice shell burst. Now we want to apply two layers of tape with those long reinforcement fibers running lengthwise on the heading. Alternating the orientation of these fibers evens out the strength of the total tape application. Apply two of the short pieces of tape with the long dimension running from the top to the bottom of the heading. Leave equal amounts of tape hanging over the top and bottom. The two pieces may not quite overlap at their edges. We'll take care of that in a moment. Now apply the other two 3-inch pieces of tape, with their edges in the middle of the first two pieces. This alternates the seams in these two layers of tape. These four pieces of tape now form two complete layers of tape on the shell. Finish the ends of the heading as before. Snip the overhanging edges of the tape every half inch and paste them down to the ends of the heading. Finish the ends of the shell with octagonal pieces of tape. These layers now form a tape application which has the long fiber reinforcements running lengthwise on the heading. The final long strip of tape, and the remaining two octagons of tape, are now applied to the heading in the same way as the first tape application was. This tape application results in long reinforcement fibers which run once again around the circumference of the heading. The heading, with its taping completed, should now look like this. Note: If the top of your rocket motor is finished with a solid clay bulkhead, and if you have not already hand-twist drilled a passfire hole through this clay plug, now is the time to do it. We must create a hole, or "passfire," through the clay bulkhead so that the motor can ignite the heading just as the last of its fuel is burning out. Using a sharp 3/16-inch drill bit, slowly hand-twist-drill a passfire hole through the center of the bulkhead in the top of the motor and just into the black-powder fuel grain. Wear eye protection and a leather glove on the hand holding the motor. 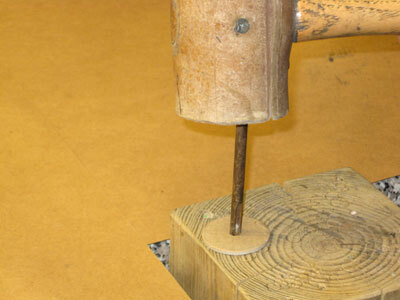 Do the drilling outdoors and hand-twist the drill very slowly through the bulkhead. When the motor's fuel burns through and passes fire through the hole in the bulkhead, the quick match fuse on the rocket heading is ignited. The heading will burst open almost immediately spreading its burning contents into the sky, and creating a starburst display. To install your rocket heading, simply cut the quick match to the desired length to fit down into the top of the motor to the top of the rocket's fuel grain. Then bare a half-inch of the black match on the fuse. 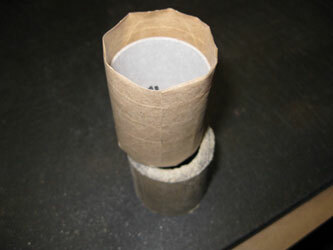 The heading can then be installed atop the rocket motor with a bead of hot-glue. When gluing the heading onto the motor, be very careful to not obstruct the motor's passfire hole with the glue. That's it! Let that hot-glue harden and you're ready to go. Fire in the hole!